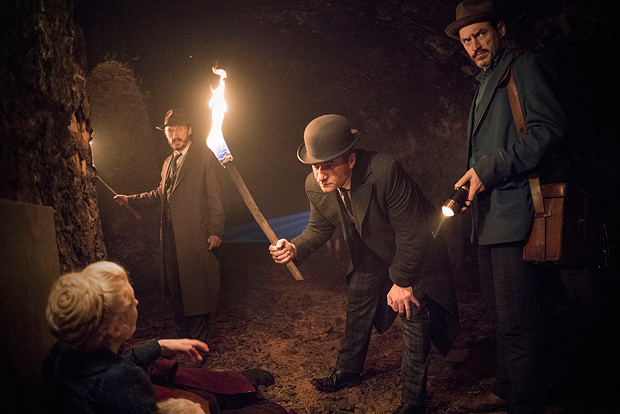 Previously on Ripper Street: Someone was going around biting people to death, which is bad. Very bad. And that someone has a connection to both Croker and Dove, and Jackson figures out who it is right before they all go to rob the customs house, so now he’s in a tight spot. Hey, is that Arthurton? Where’s he been? We begin with Drake paying his old co-worker a visit, mostly so poor Drake can have his face smashed in someone else’s incredible happiness. And so Arthurton can tell Drake that the only thing to cling to in this world is someone who loves you. That’s a mean thing to say to someone who’s having serious marital difficulties and clearly has no idea how to fix them (and honestly, neither do I). The next morning, on his way to Leman Street, Drake catches sight of a massive front-page story on the latest Golem victim. Written by Castello, of course, using the photos Reid gave her of the victim’s body as proof the Golem has struck again. Drake’s incensed and goes to the newspaper offices to yell at her, only to find Reid there already. Reid reminds Drake that they have a serious problem that needs to be addressed, so to hell with the force’s reputation at this point, and Drake folds. Poor guy’s probably just exhausted. Castello shows both men some of her research: a map showing the routes of Jewish refugees from Russia. She tells them that Ratovski led one of these bands, which was then joined by Christians fleeing the Ukraine. Has there ever been a point in history in which that part of the world hasn’t been a mess? Castello also managed to get her hands on Ratovski’s journals, which are all written in Polish, so they’re with Goren to translate. Off they all go to the orphanage, to read some really harrowing passages. Apparently Ratovski’s band was stalked by some incredibly aggressive wolves that picked people off one by one as they moved through the woods. At one point, they killed the mother of two young boys–one of the Christian refugees. The boys tried to scare the wolves off but it was no good. Drake realises that the name of the mother, Anglicised, is Dove. He and Reid figure the two boys made their way to London and grew up, but not without some serious issues. And while one of them somehow dragged himself up to become a highly decorated member of the police force, the other one is exacting revenge on the Jewish community that failed to save his mother by biting them to death. Woah. Reid suggests Castello start tailing Dove. But doesn’t Dove know her quite well? Isn’t he likely to notice? Dove, meanwhile, is going to work on Rose. He takes her for a nice walk in the park and asks what she was screaming about in front of the police station, when she mentioned knowing Drake and Reid were involved in some terrible crime. With barely any hesitation, she tells him they killed Susan’s father. Rose is really losing me this season. Castello watches the pair from a bench. Drake and Reid arrive at Leman Street to news of the customs house robbery. The two murdered guards have been brought in, and when they take a look at their bodies, they realise the stab wounds on each (very precise ones) match the stab wound on Gower. So, the Golem’s moonlighting as a robber. Croker tells Jackson where he can take the stolen vases to be fenced. Before he goes, Jackson really stupidly reveals to Croker that he knows what Nate’s been up to. Croker then sends an anonymous message to Leman Street, telling the officers where Jackson’s going to sell the vases. Thatcher and Drummond head out and catch him, dragging him back to Leman Street where both Reid and Drake use his face as a fist pinata for a while, because of course Jackson’s not talking about what he knows. He’s thrown into a cell. Castello, meanwhile, stops by to tell Drake that his wife was walking arm in arm with Dove (gasp!) and Drake, already fairly worked up, goes home to confront the pair as they come in. He ends up beating the crap out of Dove and demanding to know if he and Rose have been having an affair. She denies it. He leaves. Dove asks Rose where Theodore was killed and she tells him it was in the basement at the new Cobden Estate. Dove sends a message to Leman Street ordering the officers there to arrest Reid and Drake. Luckily, no one is eager to arrest their comrades/bosses, so everyone just sits on their hands. This gives Reid time to track down where Jackson gets his fairly unusual brand of cigarettes. He takes a field trip to Croker’s warehouse and finds Susan there. He’s startlingly unsurprised to see her, considering he saw her drop and get carted off to a mass grave. Nate is lurking there as well, and he attacks Reid, but Susan orders him to leave Reid alone. Nate flees, and though Reid chases him, he gets away. Reid brings Susan back to Leman Street and he and Drake try and figure out what the hell to do. Dove, meanwhile, is having the basement at the Cobden Estate excavated. He finds Theodore’s skeleton down there, and before he died Theodore wrote ‘Edmund Reid did this’ on the wall. Susan figures Nate would have fled to the underground tunnels he used to get into the customs house, so Reid and Drake gather her and Jackson to show them the way. They make it look like the two busted out and beat up Thatcher and Drummond on the way, so the pair don’t totally look like they weren’t doing their jobs. Outside the station, Rose shows up to screech at her husband a little more, frowning and yelling at him for not believing her, although I don’t blame him a bit for that. What’s more plausible: that an incredibly notorious woman managed to concoct an elaborate escape plan that involved her being fairly convincingly hanged and then unearthed from an actual grave, or that someone suffering from sleep deprivation and anxiety about losing the child she’s been given might have been seeing things? I’d definitely go for the latter. Drake so does not have time for this, though Susan stops a moment and asks if she can see her kid. Rose spits that Susan will never see or come near her child ever again. Honestly, Susan, how did you think that would go? Drake sadly wonders what happened to him and Rose. I kind of wonder that too. It’s like someone flipped a switch in her or something, and she went from fairly normal to screaming harpy all because her husband didn’t immediately believe that someone he saw hanged was, in fact, still alive and wandering the streets of Whitechapel. Whatever. Nate has, indeed, gone to the tunnels, but he was found by Croker first, and chained up. Croker summons Dove and tells him they really need to put Nate down, because he’s a wild animal and simply can’t be controlled. Dove makes it seem like he agrees, but then he gut-stabs Croker and releases his brother. Down in the tunnels, they find the dying Croker and fan out to find Nate. It’s Drake who comes across him, or, rather, he comes across Drake and starts attacking him like freaking Batman, flying by and hitting him before he even has a chance to react. And Drake, who’s so done, just yells that he’s killed waaaaay more people than Nate ever has before breakfast on any given morning in his soldiering days, so you know what? BRING IT. And Nate does. While Reid and the others race through the echoing tunnels, trying to find Drake, Nate stabs him and runs. Reid finds Drake just in time to spend those last few moments with his friend. Seriously? Francis on Sunday, and now Drake? 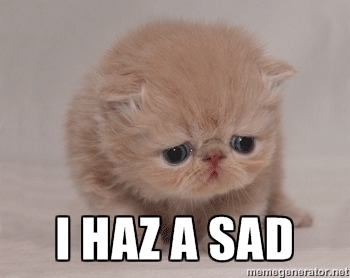 This has not been a good week, guys. 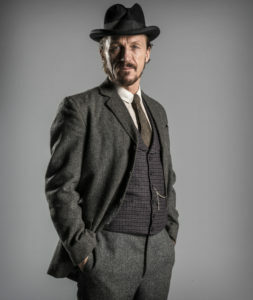 Here’s hoping Jerome Flynn now gets a bigger role in Game of Thrones, because damn, he deserves it. Next Next post: Poldark: Merry Christmas!